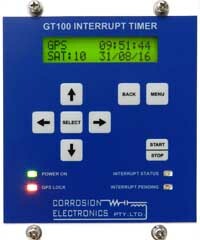 The GT100 Interrupt timer is intended to provide a means of interrupting the output of a transformer rectifier within a cathodic protection installation. The GT100 has a built –in GPS receiver which provides a high accuracy time-clock for synchronisation purposes. 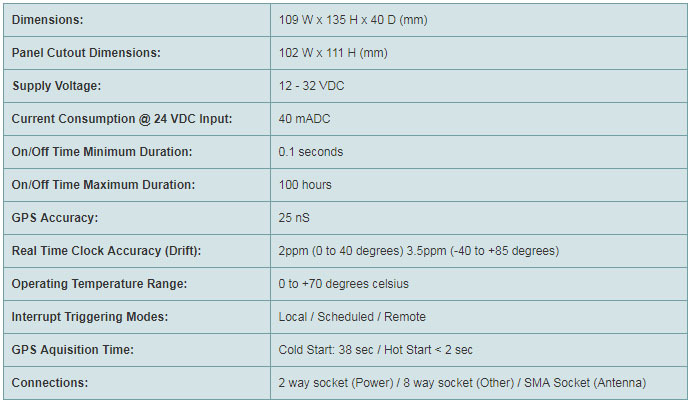 Alongside the GPS receiver is a highly accurate onboard Real Time Clock (RTC) which features a temperature compensated crystal oscillator for minimising temperature drift. The on-board RTC is updated with the GPS information once every second and will automatically take over as the primary clock source if the GPS signal is ever lost. The primary clock source can transition from GPS to RTC seamlessly and without error of any kind. Up to 8 different interrupt cycles can be programmed into the timer with each program consisting of a start date/time, a stop date/time and on/off durations.